The OM2000 is compatible with all OM-mount lenses, and accessories attaching to the finder eyepiece. (Telephoto and macro lenses with small apertures would darken the microprism of its non-interchangeable focusing screen.) No other OM accessories—TTL flash, winders or motor drives, databacks, etc.—were compatible with this camera. The 2000 was also missing the OM's distinctive feature, the shutter speed ring around the bayonet mount: on the OM2000 the shutter speed knob is on the top plate of the camera. It was also released with the S20 flash unit, that could be used in manual and auto mode, with no TTL automation. The body of the OM2000 is distinctly more lightweight and plasticky compared to other OM "single digit" bodies or even the more entry-level "double digit" cameras. It was released together with two S-Zuiko zoom lenses. The Cosina-built 35–70mm f/3.5–4.8 was only sold as a kit with the OM2000, and shares its worryingly lightweight construction. A 70–210mm f/4.5–5.6 zoom was also offered. Some regard the OM2000 as an embarrassing comedown unworthy of the OM name; but the camera has a few unique virtues. It has a mechanical shutter not dependent on batteries, with a top speed of 1/2000, and a flash sync speed of 1/125. There is a provision for double exposures. Exposure control is fully manual, based on silicon photodiode photocells switchable from center-weighted metering to spot metering. In some ways these features equal those of the rarest "cult" OM model, the OM-3. The meter readout is via viewfinder LEDs, rather than an analog needle, which may be preferable in poor light. After the OM-1, no other OM body included a mirror lockup; but the OM2000 self-timer raises the mirror and stops down the aperture at the beginning of its cycle, and thus can reduce vibration during exposure. It is worth noting that the same basic Cosina innards used in the OM2000 later became the foundation for the well-respected Voigtländer and Zeiss Ikon 35mm rangefinder cameras. 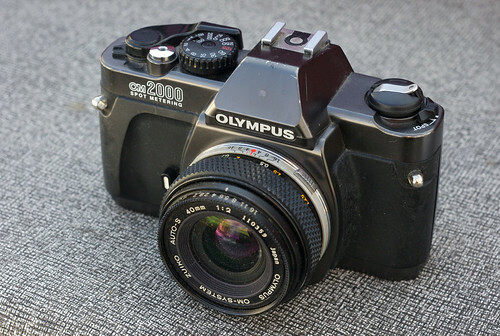 The Olympus OM2000 was only released in anthracite color. In common with some other Cosina-built camera models, the OM2000 shutter release cannot be depressed unless the film-advance lever is pulled slightly outwards from the body. Close inspection will show this is accomplished by a small tab protruding from under the advance lever and into the collar around the release button. The plastic cover of the advance lever can be removed (by loosening the screw underneath it) and an owner who is comfortable with disassembling the clips and springs underneath can disable the interlock by inverting the plate with the protruding tab. ↑ Examples include e.g. the Vivitar V4000 and Chinon CM-7. This page was last edited on 12 December 2017, at 06:32.